Secret Water Island — yes, that’s exactly what Sirru Fen Fushi translates to; the island that is home to the Fairmont Maldives. A 120 luxury all-villa resort that covers approximately 160,000 sqm of land, features one of the largest lagoons in the Maldives. The resort includes a 200-metre long swimming pool, a destination spa and a lavish open-air bamboo bar, created by Balinese artisans who did not use any man-made materials in the structure. 3 Nights Beach Sunrise Villa - 357 sq.m. 3 Nights Beach Sunset Villa - 357 sq.m. 3 Nights Water Sunrise Villa - 185 sq.m. 3 Nights Festive Season - Beach Sunrise Villa - 357 sq.m. 3 Nights Festive Season - Beach Sunset Villa - 357 sq.m. Situated on the Shaviyani Atoll in North Maldives, enjoy 3 nights of complete luxury at Fairmont Maldives, Sirru Fen Fushi, wherein every villa features a private pool. With a 200m infinity pool and safari-style tented villas, this beautiful property features Maldives’ first coral regeneration project in the form of an Underwater Art Installation that is created by underwater naturalist and artist Jason deCaires Taylor. And guess what? The nine kilometre-long house reef is directly accessible from the beach! One of the upcoming romantic destinations is the Maldives. A tropical nation in the Indian Ocean composed of 26 ring-shaped atolls, which are made up of more than 1,000 coral islands. Known for its beaches, blue lagoons and extensive reefs, Maldives is definitely your go-to destination! 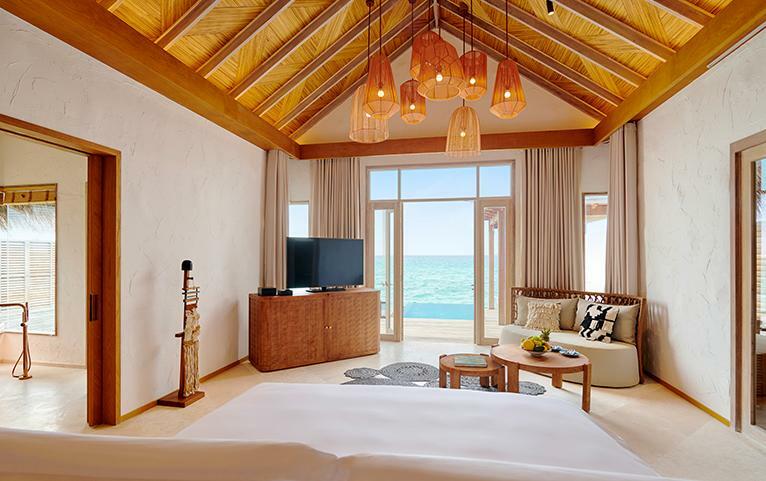 The Fairmont Maldives has gained worldwide acclaim for The Coralarium. Situated in the centre of the largest developed coral lagoon in the Maldives, is a semi-submerged tidal gallery that interlinks the skyline, inter-tidal waterline and seabed. 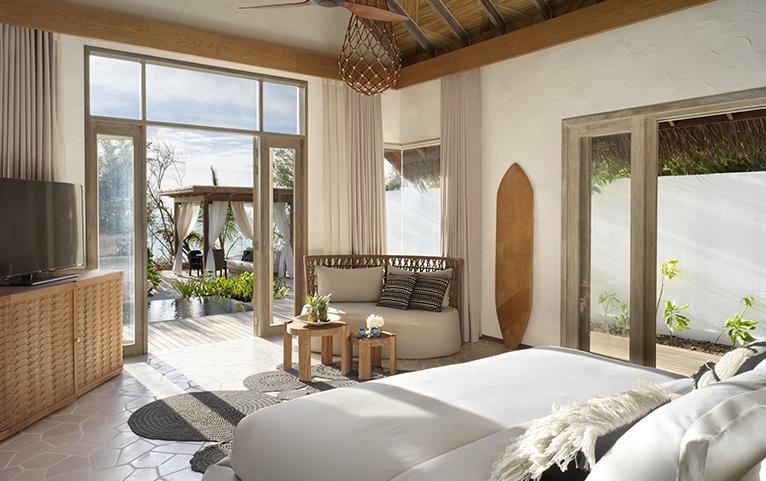 The recently-opened luxury resort features some of the most luxe villas and exquisite dining venues, making it the perfect getaway for couples. Beach Sunrise Villa: Surrounded by mangrove foliage and white sands, the Beach Sunrise Villas features an en-suite private bathroom with separate shower, Bose Sound systems and California King-size bed. With a private outdoor bathroom with bathtub and shower, a 14 sqm plunge pool, a Sala for relaxing and dining — and a personal butler, will make your stay just absolutely luxurious! Beach Sunset Villa: Equipped with all the modern amenities, enjoy your stay at this luxe sunset villa. Water Sunrise Villa: Explore the epitome of Maldives-style accommodation in an over-water villa, designed to an elegant rustic chic ethic. With a decadent over-sized copper bath tub, private sala, ladder down to the reef below, 19 sqm plunge pool, en-suite private bathrooms with separate shower and much more! Maximum Guest Capacity: The maximum room capacity is two adults. And just for Water Sunrise Villa, the room capacity is two adults and one child (below 12 yrs) or two adults. Laundry Service, Ironing and Dry Cleaning: Put up your best self while on a trip with neat and tidy clothing. With the daily laundry, dry cleaning and ironing services, you enjoy a fret-free vacation. The services are provided at a surcharge. Concierge Desk: Get recommendations and suggestions from the concierge so that you experience the best of Maldives and return with happy faces. Spa: Willow Stream Spa and a dedicated Olympic size Jacuzzi pool will rejuvenate your senses on another level. Leisure: There’s something for everyone at this Secret Water Island — from kid’s club, toddler’s play garden, Teen Town, sunset dolphin tours, Thai boxing classes, yoga, tennis and football — will keep everyone entertained. Dining: Enjoy your dining at a spot called Raha Market or at an over-water Japanese restaurant, sushi bar and sea lounge named Kata, which offers modern and Maldivian twists to Japanese dishes or at an over-water fine dining destination, Azure that serves seafood. Apart from this, the all-bamboo Onu Onu, loungers and fire pits add to the laid-back poolside atmosphere, while sunsets are best enjoyed with a sun-downer at the Kata Roof Top Bar and lounge that overlooks the entire western side of the island. Flights to Male International Airport are available from all the major metro cities in India. 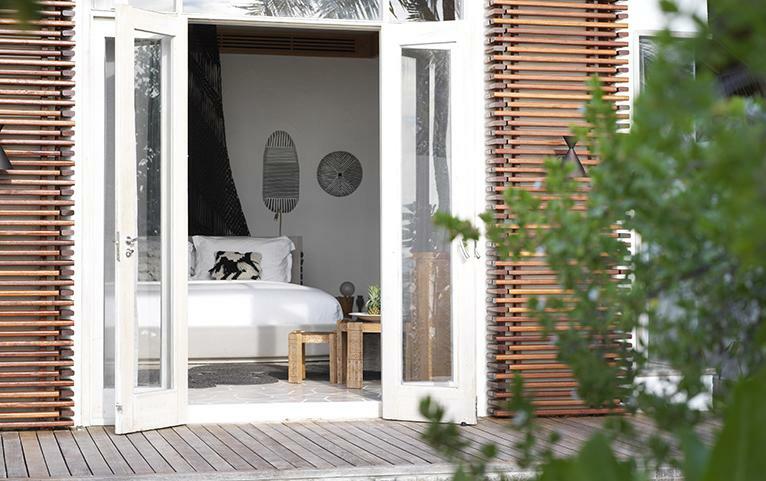 Fairmont Maldives – Sirru Fen Fushi is located approximately 230 km North of Male in Shaviyani Atoll. The seaplane transfer takes 55 mins with an alternate route possible via domestic flight to Hanimaadhoo airport. Domestic flights on Maldivian Airlines are available to Hanimadhoo followed by a 50 minutes speedboat transfer to the resort. Their speedboat transfer service operates 24 hours and can accommodate early morning and late evening flights. Roundtrip speedboat transfers are available at a surcharge. But guess what? Your roundtrip transfers are included in the package! So, worry not.